VA Home Loan FAQs | Alliance Mortgage Funding, Inc. I want to use my Veteran eligibility to purchase a home. Can you do this for me? I don’t have my Certificate of Eligibility, can you help me get one? Answer: Yes, as long we have a DD-214 or Statement of Service we can retrieve your Certificate of Eligibility electronically. I used my VA eligibility to purchase a home before can I use it to purchase another home? Why is the loan amount higher than the sales price for VA loans? Answer: All VA loans have a “Funding Fee” which is financed on top of the loan amount. This fee eliminates the need for mortgage insurance. I am disabled VET (service related), is there is an additional discount available to me? Answer: YES! The Funding Fee may be waived if you have a service related disability. Can I purchase a home with someone other than my spouse as the co-borrower? Answer: Yes, but the other applicant must be a Veteran as well. I don't live near Cockeysville, Maryland can you still handle my loan? Answer: We can handle your loan anywhere in the state of Maryland or Pennsylvania. Can I close on my VA mortgage loan close to home? How do all those documents get to my local Title Company? I already applied to another Lender for my mortgage; do I have to stay with them? Answer: No you don't. You can change your mind, and decide who you want to close your loan. Transfer of your loan is an easy process. If you have already paid for your appraisal, they must transfer it to us. We routinely save our clients more money than the lender they initially applied with. Can I use my VA eligibility for a Rental Property purchase? Answer: No. Primary Residences Only. Can I refinance my Primary Residence using my Veteran benefits? Answer: Yes. You may be able to take additional cash out to pay off other debt. How will I know what the prospective home or my primary residence is worth? Who controls the interest rate on Veteran Mortgages? Answer: The market controls VA loan rates, however VA rates are lower than conventional loans. How will I know what interest rate I will get on my home loan? Answer: We can lock your rate immediately. I am a Widow of a Veteran, can I qualify? I hate to fill out forms online; can I talk to a person? I don't feel comfortable giving my financial information over the Internet, what can we do? Answer: We will do everything over the telephone or in person. I can even come to your home if that is more convienient. How long does is take to close my loan? Answer: It varies but typically 30 - 45 days after all paperwork is submitted. I am working with a Real Estate Agent.....is this O.K.? Answer: No problem. If you need the names of some real estate professioanls, we can provide you with some referrals, too. Another lender botched my loan, can I transfer my loan to you? I want to place my loan in your hands, what's next? Answer: Call me at (410) 683-1500 and ask for Michael Mandis or Craig Brindley. 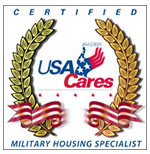 We are both a Certified Military Housing Specialist® and experts at VA mortgages. I want to move forward with you, what do I tell my Realtor? Answer: Just call me with your Realtors name and contact information, and we will handle the rest.